Karukan or Karukan Manjyu is a traditional Japanese confection. Then most famous Karukan-making prefecture is Kagoshima together with some other areas in Kyushu. 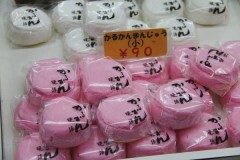 But they’re also famous in Okinawa although here they are a bit different from those made in mainland. There, Karukan or Karukan Manjyu are sold at traditional confectionery stores and considered a kind of formal sweets, but here one can find them in most supermarkets and even convenience stores. They also are sold one by one for about ¥100 each. Karukan are very popular and familiar sweets in Okinawa, and people present red and white Karukan Manjyu as gifts at auspicious celebrations.